There’s a big football game this Sunday, and for many of us, that will entail drinking beer more than cocktails. But why not enjoy both by making a punch with beer? 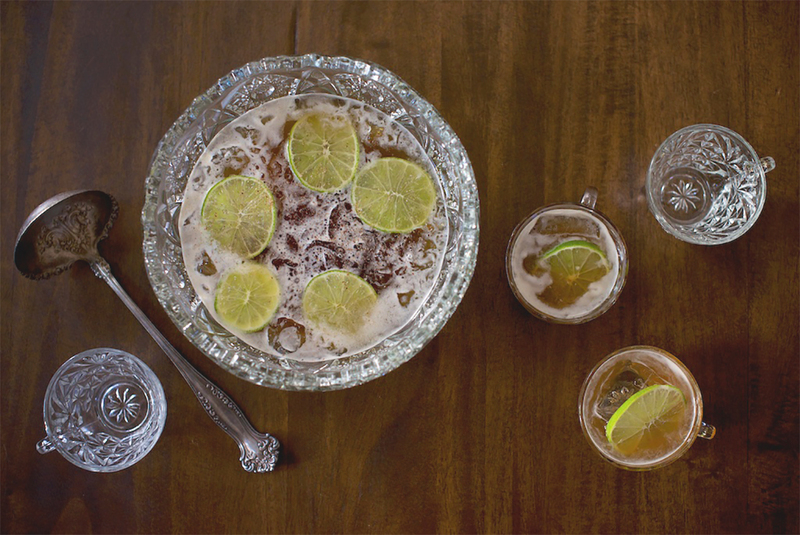 A good ale punch makes hosting easy, taking the pressure off of mixing individual cocktails while providing guests with a memorable drink. Using beer in punch might sound like the kind of terrible idea one encounters at college frat parties, but the idea makes perfect sense. Nearly all punches have a “weak” element to soften hard spirits and lower the proof so that drinks can be enjoyed over a longer session. That weak element could be as basic as water or as elegant as Champagne. But the right beer can work wonderfully as well. Erick Castro of Polite Provisions in San Diego, California, revives the technique of using a rich, dark beer in his Abbey Street Punch, which artfully combines whiskey, rum, and stout to delicious effect. He contributed the recipe to my book Cocktails on Tap: The Art of Mixing Spirits and Beer to stand as a contemporary complement to vintage punch recipes. Making Erick’s punch may require a little bit of shopping. You’ll need an Irish whiskey and an Irish stout; Jameson and Guinness are obvious and solid choices here. You’ll also need a Jamaican rum. At Polite Provisions Erick employed Appleton V/X, now known as Appleton Signature. The only potentially hard to find ingredient is allspice dram, an intensely flavorful liqueur made by infusing allspice berries into Jamaican rum. The St. Elizabeth brand is available fairly widely. The punch recipe below will serve 6-8 people, but feel free to scale up for a larger party. The spice notes in Abbey Street Punch are perfect for winter weather, and keeping a bowl flowing will keep guests happy throughout a long game. Combine all ingredients in a punch bowl with 1 cup crushed ice, then slip in a large block of ice to keep chilled. Grate nutmeg over the surface of the punch. Ladle into individual glasses garnished with the lime wheels. Combine the sugar and water in a pot over medium heat and stir until the sugar is dissolved. Let cool and store in a sealed bottle, refrigerated. – Makes 1 ½ cups. Ready to make your own Abbey Street Punch?